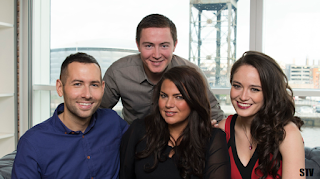 The two stations on STV's City TV Network are starting the new year with a revised schedule for viewers across the Scottish Central Belt, bringing together the output of STV Glasgow and STV Edinburgh for two new weeknightly programmes. Starting Wednesday 6 January, Live at Five will go on-air from the STV Glasgow studios at Pacific Quay every weekday from 5pm, and will be hosted by Hayley Matthews, Jennifer Reoch and David Farrell, plus various guest presenters. STV promises that Live at Five will be "packed with great guests, cooking from local chefs, live performances by local bands and features on local history and also reflecting life today in Edinburgh, Glasgow and the surrounding areas." At 11pm, new addition The Late Show, a new "tongue-in-cheek" chat show presented by Ewen Cameron will come from the STV Edinburgh studios at Fountainbridge. Previous evening shows The Riverside Show (STV Glasgow) and The Fountainbridge Show (STV Edinburgh) have been axed as part of the changes - their presenters having been carved up between the two new shows being launched this week. Although the changes now mean the majority of programmes are shared, the two STV City TV stations retain separate lunchtime and 10pm news bulletins. STV Glasgow and STV Edinburgh are currently broadcast on Freeview channel 23, but will be allocated a new Freeview channel number in the coming months following the closure of the BBC Three TV channel (the exact number is subject to a consultation taking place at the moment). Sky viewers in central Scotland can see their relevant City TV service on channel 117. On Virgin, the channels are found on 159 in their broadcast area. STV Edinburgh celebrates its first year on air this month. Meanwhile, STV is in the process of launching new local services for Aberdeen, Ayr and Dundee following a successful bid for more local TV licences last year. The channels share much content anyway... And this is really just a 'reboot' of an old idea STV once had; teatime magazine show... It'll work fine in that slot. Many people live and work between the two cities anyway. It would serve them well though if they paid some attention to the technical quality of their output. "People's History" for instance has some great (brilliant actually)content, absolutely ruined by truly incompetent camerawork and amateurish production! Much of the music and local bands... Brilliant but shot in a broom cupboard and sounds awful! Why?? Scotland has one of the most creative music scenes in the world? Resource the damn things properly STV! I hope when STV Aberdeen launches that we don't just get more Glasgow-based shows - we already have enough of that on STV and BBC Scotland; proper local TV would be nice! The whole of the old ITV network has really been wrecked. Mixed feelings are due where Scottish broadcasting is concerned. On the one hand you might argue that STV saved the day as Grampian's demise was almost inevitable. On the other - it's difficult to have any confidence in those at the helm; they seem not to understand the culture of the central belt... The north is another planet! The whole of Scotland would benefit from a once-again properly independent company serving the North. We just don't see enough of it down here! And it's not as if you fall off the edge of the world when you keep going past Perth!